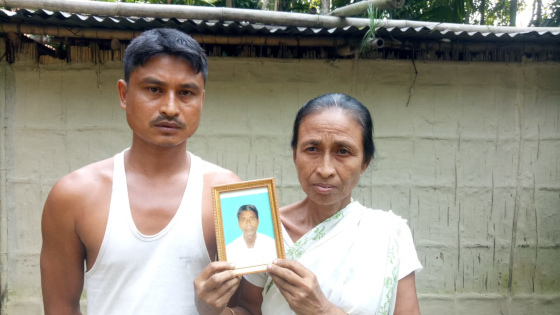 Santi Rani Chand’s son Binay hanged himself in September 2018 because Santi was declared a doubtful voter–a descriptor for those with questionable electoral credentials, suspected of being illegal Bangladeshi immigrants. There have been 21 such suicides in Assam since 2015 when the process of updating the National Register for Citizens to weed out illegal immigrants from the state began. I read this article and found it very interesting, thought it might be something for you. The article is called Fear Of Losing Citizenship Is Driving People To Suicide In Assam https://www.indiaspend.com/fear-of-losing-citizenship-is-driving-people-to-suicide-in-assam/. 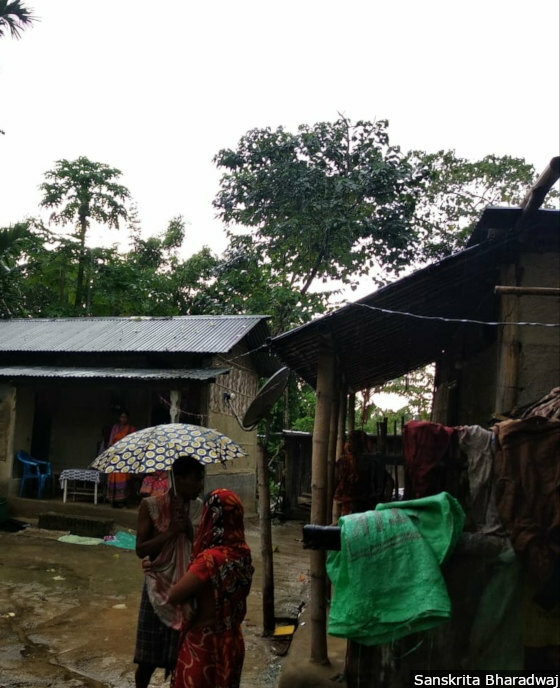 Dimlarpar (Bodoland Territorial Council), Assam: It was a rainy September afternoon in this remote village in Baksa, a district of the Bodoland Territorial Council (BTC) in western Assam. Outside a small tin-roofed mud house, Santi Rani Chand, a frail 72-year-old clad in a white saree, sat on a wooden bench recalling her youngest son’s suicide. 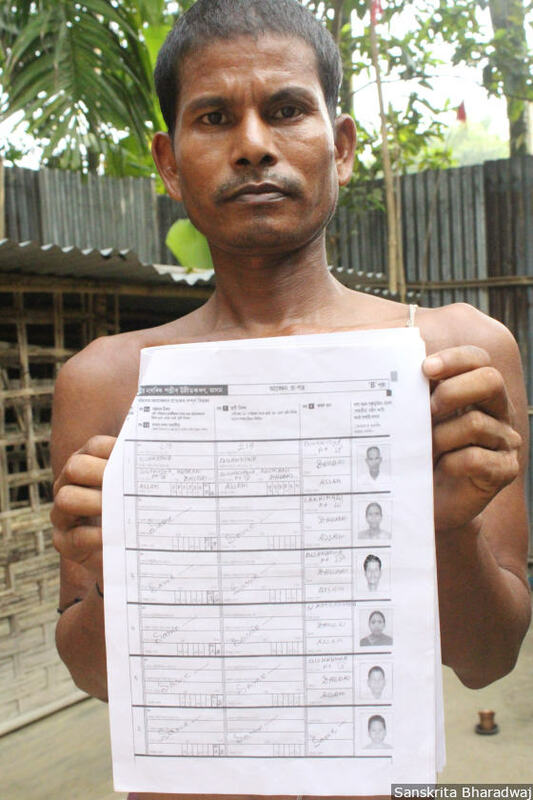 In Assam, ‘D’ or ‘doubtful’ voter is a descriptor for those with questionable electoral credentials, suspected of being illegal Bangladeshi immigrants. It is an idea unique to Assam, a state which has been roiled by the issue of illegal migration from bordering Bangladesh. An inquiry initiated by the Election Commission or a “reference” made by the Assam Border Police Organisation--both can end in a D voter stamp. There were 4,85,640 D voters in Assam as of March 2018, according to official data. The foreigners’ tribunals--quasi-judicial bodies that decide on citizenship issues in the state--have declared over 92,000 people “foreigners” and of these, 1,000 are in detention camps located in six jails across Assam. There were four such tribunals in Assam in 1964; now there are 100. The NRC lists those who can prove that they or their ancestors entered Assam on or before March 24, 1971--the start of the Bangladesh Liberation War. The latest draft of the NRC published on July 30, 2018, has left out around 4 million of 32.9 million applicants from the list of citizens. IndiaSpend met four families in three districts of Assam where exclusion from the NRC, the fear of being declared “foreigner” and being sent to detention centers drove people to suicide. The victims we met were mostly poor, illiterate and marginalised, lacking in resources to clear their names at foreigner tribunals or appeal in higher courts. 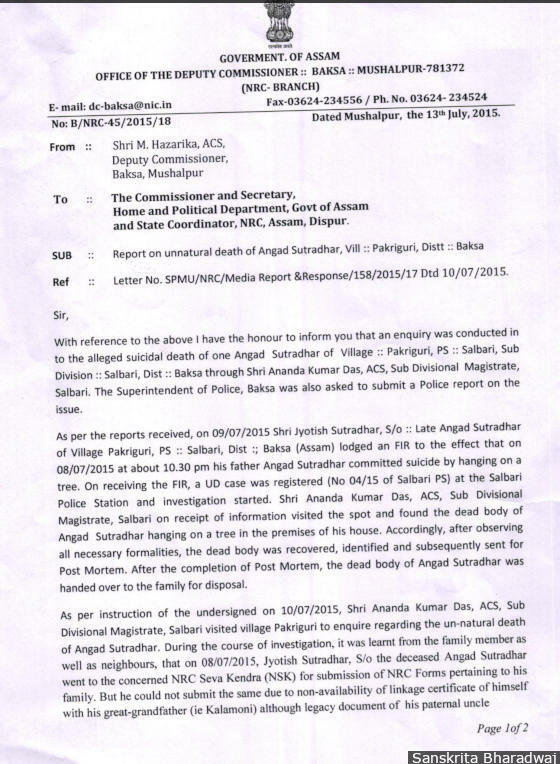 The latest tragedy was reported on October 28, 2018, when Deepak Debnath, 49, was found dead in the backyard of his home in Udalguri in western Assam. Debnath was allegedly depressed after a recent notice issued by a foreigner’s tribunal asked him to prove his citizenship. Authorities have questioned the links between these deaths and citizenship issues but victims’ families are emphatic that the fear of deportation--and eventually being stateless--was the reason. After Independence, there were two massive waves of refugee influx into Assam from across the border--first after India-Pakistan Partition, and then, in the run-up to the 1971 Bangladesh Liberation War. This fear pushed the movement, popularly known as the Assam Agitation, led by the All Assam Students’ Union (AASU) between 1979 to 1985. It ended with the signing of the Assam Accord between the then Prime Minister Rajiv Gandhi and the AASU. The accord fixed March 24, 1971, as the cut-off date for people entering Assam to claim Indian citizenship. In the suicide cases we investigated, the victims had felt themselves helpless against the state’s power to determine their fate. Santi, declared a D voter in 2009, got a notice for appearance before the Baksa foreigners’ tribunal on April 26, 2018. The Assam Border Police Organisation, the only state with a force dedicated to stopping illegal migration, had made a “reference” about her which needed verification. But multiple visits to the tribunal did not help. These visits were sometimes conducted late night, said the article, part of a series titled 'The Making and Re-Making of Indians as Citizens in Assam'. “The men from the Border Police knocked at my door on the night of June 8 and said that my name had been rejected from the NRC," Jamila, 29 and a mother of two, told CJP. "I wondered how this was possible as I had submitted school leaving certificate, voter ID, my father’s voter ID, as well as my Panchayat certificate.” The men asked her for the names of her children and then took her fingerprints, she added. Women form almost 50% of applicants who haven't made it to the NRC and most of them are from "socio-economically backward communities", said the report. 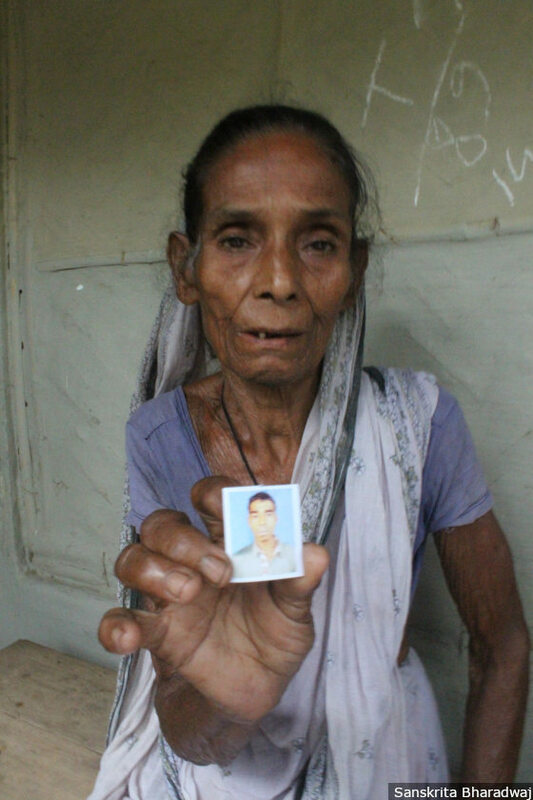 Santi Rani Chand, 72, holds up a photo of her dead son Binay Chand, 32. Santi was declared a D or doubtful voter. Her case was sent as a ‘reference’ to a foreigner’s tribunal in 2016. In the months before Binay hung himself, he ran from pillar to post to prove his mother’s citizenship. This meant proving that she had been present in Assam on or before March 24, 1971. “He was stressed--he needed money, which he didn’t have because he was a daily wage laborer,” said a neighbour. Binay would often talk about going to a lawyer in Guwahati but he had no idea how he would pay for the trip or the counsel, his mother recalled. The youngest in the family, Binay had three elder brothers and all of them worked as daily wage laborers. Outside Santi Rani Chand’s house in Dimlarpar village, Baksa, Assam. On September 5, 2018, NRC coordinator Prateek Hajela proposed to the SC that the list of documents acceptable be reduced from 15 to 10. The refugee registration certificate is one of five documents to be left out, along with the 1951 NRC, citizenship certificate, pre-1971 voters’ list and ration card. However, the SC on November 1, 2018, rejected Hajela’s proposal and have allowed claimants to rely on these five documents. Mahendra Barman, 30, (centre) with his mother and wife. Mahendra’s father, Deben Barman, 70, hung himself from a tree on August 7, 2018. “My cousin called me the next day to inform that something terrible has happened,” he said wiping the sweat off his face. 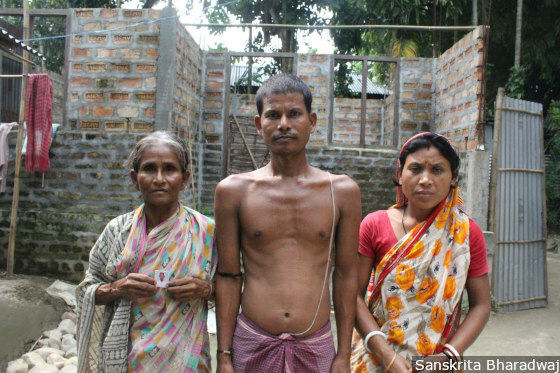 Deben, who belonged to the Koch Rajbongshi community, committed suicide on August 7, 2018, after the names of Mahendra and his two grandchildren Kishan, 16, and Mousomi, 12 were not included in the NRC. Family members recalled how Deben was upset when he came to know that the names of his son and grandchildren were missing from the NRC. “The NRC Seva Kendra had called us for a hearing before the final draft was out--I had my voter ID card, school-leaving certificate and my grandfather’s name was on the 1958 voters’ list, but they said it won’t work,” Mahendra recounted. Mahendra Barman holds up his family's NRC application form. Jyotish, 35, with his mother Bhanita Sutradhar--son and wife of Angad Sutradhar, who committed suicide in 2015. He may have panicked because he was unable to trace his legacy back to his grandfather, said his family. Photo by special arrangement. 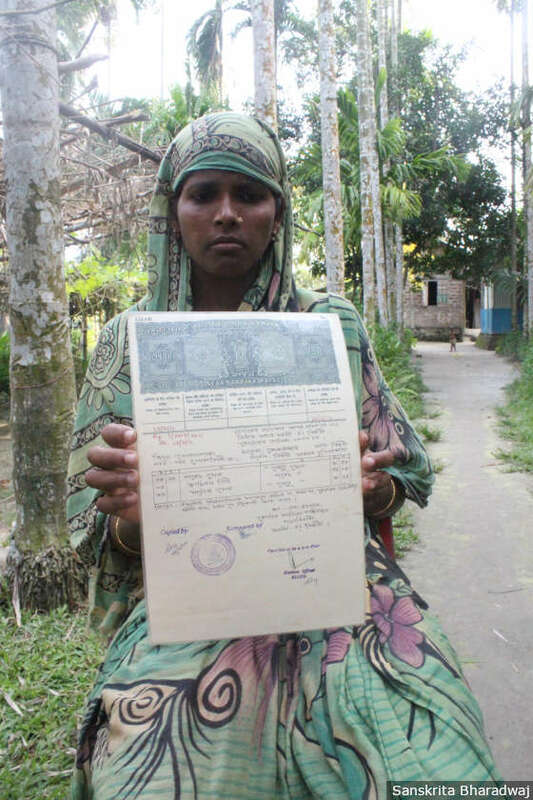 Moriam Begum, 33, with a certificate copy of the 1966 electoral rolls with her grandfather’s name. She received a notice in 2015 from the Assam Border Police Organisation, asking her to prove her citizenship at the foreigner’s tribunal in Bongaigaon. Aklima Bewa, 62, Moriam’s mother, killed herself in 2016 fearing for her daughter’s citizenship, said the family. Aklima Bewa’s body was found 300 metres from her home in Dankinamari, a village in the Bongaigaon district of lower Assam. It was September 8, 2016, and Moriam Begum, her daughter, still can’t shake off the suspicion that her 62-year-old mother might have killed herself. A few months before the suicide, Moriam had been declared a D voter. “When my mother’s body was found, it bore no injury but little blood was oozing out of her mouth,” she said. Jyotish, 35, with his mother Bhanita Sutradhar--son and wife of Angad Sutradhar, who committed suicide in 2015. He may have panicked because he was unable to trace his legacy back to his grandfather, said his family.Photo by special arrangement. The report has been written after on-the-spot visits and interviewing family members of the victims. Praise worthy efforts by Sanskrita Bhardwaj.